It's a snowy day in Atlanta. It's a site us southerners are not used to! It's beautiful and confusing for us warm weather junkies. It may be one of the first times many of us have used our fireplaces, which got us to thinking about these indoor centers for burning wood. What is so great about them? If we rarely use them, do we really need them? The answer is a resounding "Yes!" 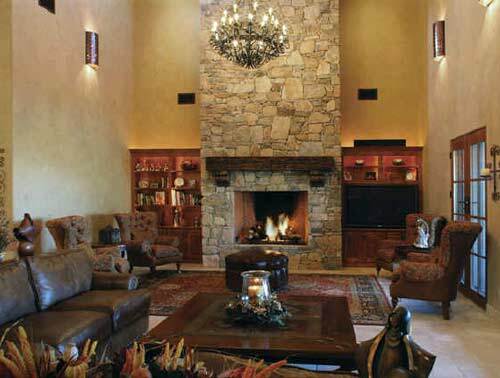 Realestateabc.com says that for the best resale value an home "absolutely must have" a fireplace in the family room. Nigel Kelly, a freelance writer out of LA, also wrote about them, "the offer you receive for your home from potential buyers could be impacted by the small details in the interior. A great looking fireplace can turn even the most drab, boring room into a picture pretty space." A fireplace, and all it's accouterments, also make a great focal point for a room - from a design perspective. Let's look at some fireplace inspiration from those who have really made their hearth the heart of the room!